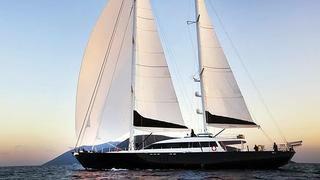 The Esenyacht Shipyard in Bodrum, Turkey, has delivered the 36m ketch-rigged gulet Glorious. Designed by the yard's in-house team and built in wood to RINA class, Glorious accommodates eight guests in a master suite, two double cabins and a twin cabin. A crew of up to six can be accommodated in three crew cabins. Ketch-rigged with a main mast of 34.5 metre, a mizzen mast of 28 metre and a total sail area of 1,340sqm (including spinnaker), Glorious also has twin 500hp Iveco engines, which give her a cruising speed of 12.5 knots under power. With Glorious now delivered, Esenyacht has already announced a new project - a 47 metre sailing yacht.